In her celebrated memoirs of life in Tuscany, Frances Mayes writes masterfully about people in a powerful and shaping place. 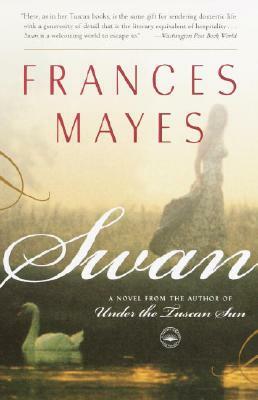 In Swan, her first novel, she has created an equally intimate world, rich with striking characters and intriguing twists of fate, that hearkens back to her southern roots. The Masons are a prominent but now fragmented family who have lived for generations in Swan, an edenic, hidebound small town in Georgia. As Swan opens, a bizarre crime pulls Ginger Mason home from her life as an archeologist in Italy: The body of her mother, Catherine, a suicide nineteen years before, has been mysteriously exhumed. Reunited on new terms with her troubled, isolated brother J.J., who has never ventured far from Swan, the Mason children grapple with the profound effects of their mother's life and death on their own lives. When a new explanation for Catherine’s death emerges, and other closely guarded family secrets rise to the surface as well, Ginger and J.J. are confronted with startling truths about their family, a particular ordeal in a family and a town that wants to keep the past buried. Beautifully evoking the rhythms and idiosyncrasies of the deep South while telling an utterly compelling story of the complexity of family ties, Swan marks the remarkable fiction debut of one of America’s best-loved writers. In addition to her Tuscany memoirs, Every Day in Tuscany and Bella Tuscany, FRANCES MAYES is the author of the travel memoir A Year in the World; the illustrated books In Tuscany and Bringing Tuscany Home; The Discovery of Poetry, a text for readers; five books of poetry; and most recently a southern memoir, Under Magnolia. She divides her time between homes in Italy and North Carolina. Visit France Mayes’s blog at www.francesmayesbooks.com. "This remains a solid read, sure to please readers who enjoy Southern fiction." "An assured fiction debut...Like Richard Russo's novel Empire Falls, it smartly dissects and dynamics of small-town relationships and the interplay between prominent families and the less powerful over several generations...carefully constructed...you'll fall for "Swan." "Fueled by irresistable, page-turning questions." "A painstaking study of a small Southern town and its people...combining [Mayes's] talent for vivid scene-setting that [she] showed in "Tuscan Sun" with deft plotting and solid character development." "Loaded with finely-drawn minor characters and the alluring atmosphere of the American South, Swan is a well-paced...entertainment."